Medical errors are costly and often preventable. This course closely examines the prevalence and various causes of medical errors and proposes prevention strategies. You will learn about medical errors by observing common errors that could occur in your practice as well as how you can prevent medical errors and improve patient outcomes. You are the front line for recognizing and preventing medical errors. 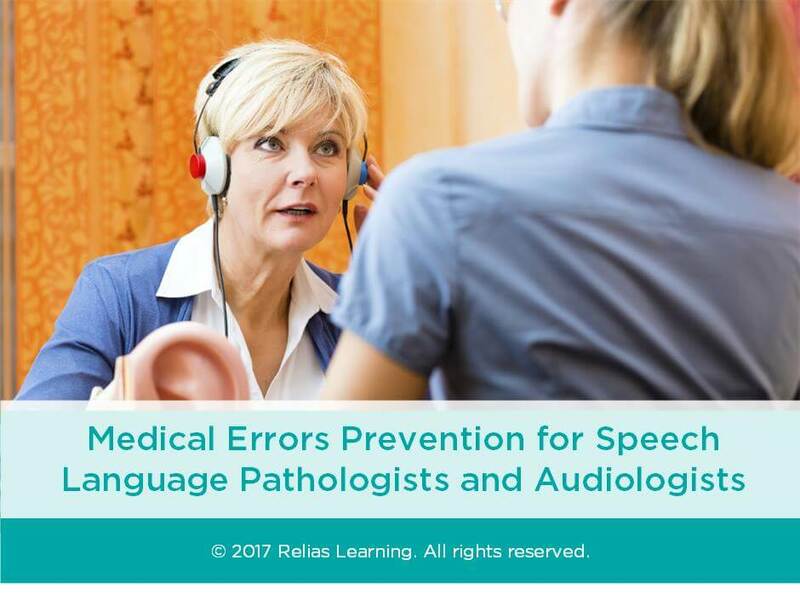 State the factors that impact the occurrence of medical errors in speech pathology/ audiology practice. Define and classify medical errors. Select medical error prevention strategies. Describe an effective strategy to inform a patient and their family about a medical error. Section 1: Introduction A. About This Course B. Learning Objectives Section 2: Medical Errors in SLP and AUD Practice A. Overview B. Medical Errors C. Patient Safety Events D. Sentinel Events E. Impact F. Medical Errors in SLP and AUD Practice G. Example 1 H. Example 2 I. Example 3 J. Example 4 K. Other Types of Medical Errors L. Technical Errors vs. Moral Errors M. Scope of Practice N. Review O. Summary Section 3: Preventing Medical Errors A. It Begins with the Diagnosis B. Diagnostics Errors C. Reasons for Medical Errors D. Root Cause Analysis E. Common Root Causes of Medical Errors F. Let’s Review G. Transitions H. Documentation I. Drug Administration Errors J. Drug Name Confusion K. At-Risk Behaviors L. Minimizing Medication Errors M. Dangerous Abbreviations N. Healthcare Associated Infection Errors O. Fall Errors P. 5 Steps to Safer Healthcare Q. Let’s Review R. Summary Section 4: Improving Outcomes A. Collaboration B. Feedback C. Clinical Reasoning Skills D. Goals and Recommendations E. Preventing Adverse Events F. Ask the Patient and Family G. Limited English Proficiency H. Challenges for Other Special Populations I. Another Clinician’s Error J. Example K. Reporting Medical Errors L. Does Everyone Report Medical Errors? M. Penalties N. State Requirements O. National Reporting P. Person-Centered Care and Education Q. An Active Role R. Medicine S. Hospital Stays T. Surgery U. Other Steps V. Effects on Patient and Family W. Keep Up with Latest Practices X. Online Ethics Y. Plan Ahead Z. Apologize Appropriately AA. Let’s Review BB. Summary Section 5: Conclusion A. Summary B. Course Contributors C. Resources D. References E. Congratulations! Twenty years of healthcare experience in regional rehabilitation management, national training, clinical management, life care planning, case management, cross-departmental training, program evaluation, and accreditation preparation. Operational experience includes ten years of facility-based clinical management; six with the Mediplex group, focusing on brain injury rehabilitation programming; and four years with TheraTx, Inc., focusing on post-acute geriatric rehabilitation in the skilled nursing setting. Private consulting for three years focusing in the areas of life care planning, program accreditation and certification, program evaluation, education and training, and case management. Three years of regional operational management for Vencare, with management responsibility for twelve geriatric SNF-based rehabilitation programs. National management trainer for TheraTx and Vencare in the areas of financial management, customer relations, and marketing. Disclosure: Edie Deane, MS-CCC/A, CCM has declared that no conflict of interest, Relevant Financial Relationship or Relevant Non-Financial Relationship exists. The target audience for this course is: entry level Speech and Language Pathologists; in the following settings: Post-Acute Care, Rehabilitation Settings.